I live in Topanga Canyon in Los Angeles and my house backs on to the state park and hundreds of miles of the santa monica mountains. I have taken my dog Krissi out the back there for nearly a year hiking trails and have occasionally seen coyotes, but we have always kept a respectful distance. I do have her off leach as this is her home, but she is well trained and rarely goes far from me. When we are at home, she does jump the fence and has free access to an area she seems to stay in. I have seen coyotes on the ridge above our house. Krissi has been keen to chase these coyotes off ‘our patch’ if she senses them within theses boundaries. She is a german shepherd/ healer mix and is very quick and smart, but also very gentle. Not at all agressive. I have always felt a bit nervous of her going out there and have kept a close eye out, but I trust her and she seems to be clear within this boundary. In the last weeks I have been dog sitting another young dog, 2 year old, Lady. She is a hound mix, with some pit bull in her. Krissi has now got much more confident, and is leading Lady off on adventures, where they have been gone for up to an hour and come back exhausted. This morning, they were keen to get out at around 7am for a pee, but they jumped the fence and went high tailing it up to an area above the house. I heard what I am sure was a coyote squeeking/yelping and both girls went off in what sounded like hot pursuit. I called and whistled and they came back 10 mins later, Lady with no collar on, and they were both panting, elated and thirsty. There was no signs of a fight or any blood or anything that led me to think there had been a conflict of any kind. It is a dilemma for me, because I obviously want to protect wild life, but I also want to give my dog(s) freedom to be able to explore and be free. I dont want to leach them all the time and I cant fence the property. Can you let me know your thoughts, as I dont feel right that they are chasing or harrassing Coyotes. Thank you for contacting me. Mine are all “urban” observations and have to do with pets/coyote interactions in the city under human supervision: in these urban areas, dog predatory behavior is kept in check by the presence of alpha humans. In rural areas, when humans aren’t around, anything goes. I’ve consulted a wildlife behaviorist for input here. Since the size of your dog is large, it can hold its own against any coyote. Please realize that the behavior of your dogs away from home can be quite different in how they interact with other smaller animals. The breeds you mention have a high prey drive. Left to their own devices, it is highly likely that they will chase and they could even kill coyotes and other animals. Most dogs look elated after a predatory chase and a kill. That the collar was off suggests that there may have been a struggle. Shepherds’ and Pit Bulls’ mode of dispatching other animals is to grab and shake — and it doesn’t necessarily draw blood. Two dogs have now formed a pack, making them more dangerous to wild animals. And both dogs outweigh coyotes — there is no contest. I’ve read and heard about dogs which have established respectful relationships with coyotes in rural areas — they read each other well, and they respect each other’s boundaries and keep their distance. If your dog is exhausted and happy from running, it doesn’t sound like this is what is going on. In city parks, I have never seen coyotes and dogs frolicking together just for fun. In the parks, a “truce” between the animals is maintained through respecting critical distances and keeping dogs away from coyotes. Alpha humans are always there to moderate the dogs’ behavior. Dogs and coyotes don’t really like each other. Also, if there is a coyote pack/family, they could get fed up with what they consider to be harassment within their territory, especially when your dog is alone. If there are “raspberry” abrasions on Krissi’s legs, or a nip on the haunches, these constitute clear messaging to your dog from the coyotes that they want your dog to stay away. So, although this might be an unhappy solution for you, my suggestion would be to not to allow your dogs free reign in this area. Hope this helps! Apologies for the very late response and for your time in answering my then, current issue. I’d like to share briefly the outcome of the story. Unfortunately, due to fencing costs, the amount of land that I have and my adjacency to the state park, I was not able to stop my dogs from running off the property. What I did, was to be vigilant about them staying close to me over a month or so and to train them to come at my call. I kept them in from ‘magic hour’ before the light changes at dusk, or from going out early in the morning, unless accompanied. Since that initial incident, there have been no such behaviors of chasing, or any nicks or bites to my dogs. I have not seen the coyotes near my property since and my dogs have not been out on any ‘hunts’ as far as I can see. 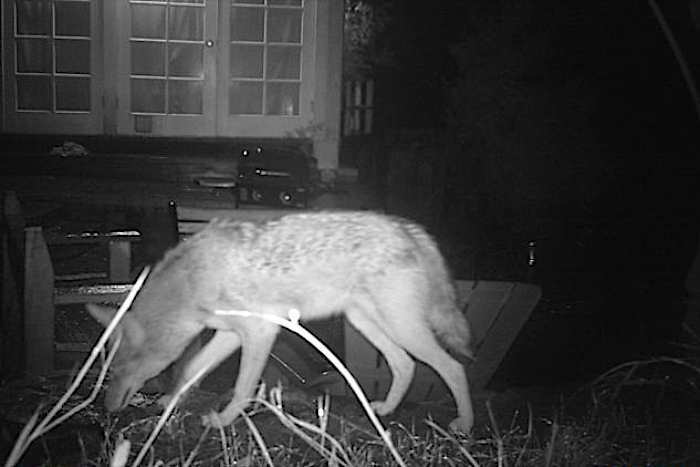 The coyotes used to come right into the garden and close to the house, as I caught them on my wild-life camera. My dogs have been staying at a closer radius to home. It seems the game is over. My conclusion is that there was indeed a dialogue between them, the coyotes very clearly showing they did not want the dogs in their area and it seems the message got across and an agreement was made. I am putting up the wild-life camera again to see if the coyotes are around further up the ridge, so I’ll see what is happening, if anything. Best wishes and thanks again for your time. You (Sandy) sound like a great dog mom, though I have concerns that eventually someone is going to get hurt. But I hope not. Would love to see a pic of your GSD/Heeler mix. For what it is worth, about 5 years ago my two dogs (Red Heeler and Boxer/Beagle mix) jumped our fence and chased a doe which ran across the road and into the field there. They were circling the deer (I was in the house and not aware of their escape). I’m certain the Heeler was attempting to herd the deer home! However, a man in a pickup truck stopped, took his shotgun out and was just putting a bead on my dog when a neighbor up the road saw him and yelled for him to stop. He walked down the road to the “hunter” and said he was pretty sure they were our dogs. The hunter said he was so sure that the Heeler was a coyote attacking the deer! He made the decision to shoot her (illegal to shoot from the road and people can no longer shoot a dog here in NY – the DEC must be called if a dog is seen chasing wildlife), which thankfully never got to happen. Needless to say, within two days our entire fence was electrified and problem resolved. If your dog has a “predator” appearance, I’d be very concerned, especially if hunting (or trapping) is allowed on those state lands that you mention. I’m seeing hunters as dangerous — they are simply snipers, picking off who they want. No one should be able to pull out a gun and shoot without a thorough investigation of what is going on. Interesting that the hunter probably wanted to “save” the doe so that he could shoot it at some point. Isn’t that the truth? It always amazes me when some hunters mention their need to kill predators because – “did you ever see a coyote eat a fawn alive! ?” Well, I guess it would be unusual for them to eat them DEAD unless they were roadkill! They are so protective and suddenly humane-oriented depending on the time of year I suppose. And what season is open on any given species. Hi Sandy and Janet. Over a few years and by experimentation I’ve watched how my dog mishandled freedom. He has been bitten by a rattlesnake, jumped into cactus, gotten into a running stream he couldn’t think his way out of, and been sprayed by skunks. He has shaken and killed prey animals without understanding that they are food, never eating them and thereby wasting a resource for a hawk, owl, or coyote all of whom do understand that prey animals are food. With coyotes he has gone into a den area, found the coyotes and barked and barked at them pointlessly, distressing the coyotes. He digs for fun not understanding the purpose, never having had a real job. The coyotes on the other hand understand it all, have real jobs, don’t ‘get’ dogs except that dogs are an annoyance though perhaps a few times fun. But coyote fun with a dog doesn’t lead to anything practical like effective hunting, a family and a place of their own to protect. In a harsher climate, a dog chasing a coyote can deprive the coyote of the energy reserves it needs to survive the coming cold night, or to get its next meal. It was disappointing for me to realize that my dog’s tasting of coyote-like freedom lead to misuse of it and to waste. I came to understand that coyotes are far from free. Instead, I view coyotes as a pragmatic, disciplined, conservative sort who still somehow make harsh life look like its all about fun. Beautifully written and right-on! Thanks, Charles, for a great comment! Such an interesting post and comments. The follow up letter especially revealing if it’s true dog and coyote learned from each other. We as humans would like that to be the outcome, I would imagine, as our own particular species hasn’t figured out how to do that yet. Thoroughly enjoyed reading. I’m visiting again Janet, because neighbor’s coyote back, big time. New post soon. Hello. I have been reading through your site and find it extremely interesting and a very valuable resource. I would like to tell you of an experience we had with our Chiweenie (chihuahua/dachshund cross). I really want to know what you think. My 6 year old female chiweenie was off leash with my 20 year old son in Kelowna, BC, Canada for a hike up the mountain. I don’t usually take her off leash because she doesn’t have good recall or car sense. However, my son had her stay close by during his hike. During their hike, she spotted a coyote. My son thought it was a small German Shephard. She bolted and didn’t listen to his commands to stop. When she got to the coyote she jumped around it and barked. The coyote nipped at her as if to say “get lost”. The coyote ran away and my chiweenie ran after it. My son was desperately trying to get her to stop…..yelling and running down the mountain chasing her. At that point another coyote showed up and joined the chase. So all three went running over the cliff and down into the bushes. My son called and searched but there was nothing. No barks, no howls. Nothing. He went back to the trail and talked to people about our missing chiweenie. 10 minutes went by….as he says “the longest 10 minutes of my life”. All of a sudden, our chiweenie Ruby wanders up behind my son….wet,panting..but tail wagging. What a relief!! It’s been a few days and I still wonder how she managed to get away? I wonder what happened during that 10 minutes? I’m posting here because I wonder if anyone knows what might have happened at that time? It seems impossible for a chiweenie to escape 2 coyotes. Any thoughts are appreciated! This is interesting — though I’d prevent it from ever happening again! Someone once wrote me that they had observed their very small dog, I believe a young dachshund, escape from their yard into the forested area in back of their home and return, after hours, all wet. 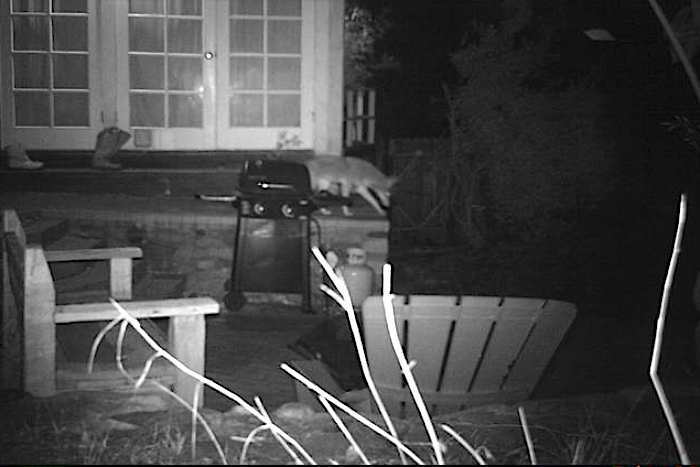 It happened several times by the time they discovered coyotes lived back there. The owner thought that the coyotes might have been licking the little dog all over making it wet — possibly treating it as one of their own pups. This is the closest similar behavior to what you describe that I have heard about, but I have no explanation for it. This is pupping season — litters are starting to be born anytime from now through about May. I wonder if the behavior is related to this? I have watched a coyote youngster curiously and carefully follow a small lost dog through a park without harming it. The coyote tried getting close, but whenever the little dog turned to face the coyote, the coyote backed off, unwilling to risk getting close to the little dogs snout! A possibility is that what you encountered were coyote youngsters more interested in play than anything else.